Our fruit syrups are made only with fruit, sugar and lemon. We do not add any artificial preservatives, colours or flavours. Yummium fruit syrups can be used for making fruit soda, lemonade or as a topping to pancakes, waffles and ice creams. Yummium’s 100% Natural Fruit spreads are premium fruit spreads with more than 50% fruit content and no artificial additives like preservatives, colour or flavour. Enjoy these naturally yummy seasonal fruit spreads as breakfast spreads or as dessert toppings. We have more than 12 variants of fruit spreads using seasonal Indian fruits and select International fruits. Yummium’s 100% Natural range of Pickles are a product of traditional Indian recipes and modern chemical free preservation techniques. 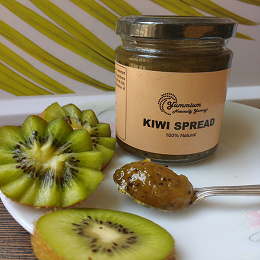 Our constant endeavour is to bring forth many such treasures that not only have health benefits but also offer a delightful accompaniment to ever day meals.Konkan Kitchen handcrafts 100% Natural fruit spreads. No preservatives, no chemical additives.